The end of the school year will be here before you know it and one way to celebrate fun, learning, and a job well done is to have a school carnival. They’re a great way to raise funds for your school or to bring students and the entire community together to celebrate the end of the year. If you’re in charge of planning a school carnival, you need to stay on top of a lot of moving parts. NY Party Works can help you turn your plans into reality. We’ve been in the party and event planning business for 30 years. We carry up to $6 million insurance and we’re fully licensed. We’ll maintain a safe, fun environment for your school. Insurance considerations and applying for permits are two big considerations when you’re planning a school carnival, according to PTO Today. There are many other things to keep in mind such as setting a date and time, establishing a theme and putting together a budget and staff. But the most visible part of your carnival will be the games and attractions and NY Party Works has a number of products that are sure to make your carnival a hit! 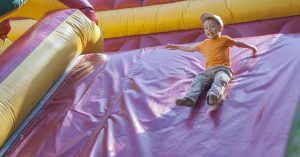 Inflatables are very popular at school carnivals and NY Party Works has them from the traditional bounce houses that come in a variety of sizes to interactive inflatables such as the Wrecking Ball and obstacle courses. Another hit, are inflatable slides including our 24-foot Patriotic Double Lane Slide. It’s red, white and blue and promises big fun. We also have terrific inflatable games. One of our newer and popular games is Hippo Chow Down. Think of it as a giant game of “Hungry Hungry Hippo.” Players are tied to a bungee cord and race to see who can pick up the most balls in the playing area. Or you can play Gaga Ball. You can get your kicks playing with our Soccer Dart. Or try your hand at inflatable midway games like the traditional favorite Whack a Mole. Or get your frogs jumping with our inflatable Happy Hoppers. If your guests want to show off their athletic ability pick up a football and play QB Blitz. Booths, Games, Food and the Dunk Tank! But not everything at a school carnival needs to be inflatable. NY Party Works can provide you with a traditional carnival booth, ideal for games or serving food. We can also set you up with food machines that can make popcorn, nachos, cotton candy or Sno-Cones. Guests can pick up a putter and play Mini Golf on our 9-hole course or you can take part in a school carnival classic: The Dunk Tank. Students can pick up a ball and try to submerge their favorite (or least favorite) teachers. It’s the ultimate revenge against homework! Another exciting activity is Eurobungy. Up to four people can soar through the air at the same time. Putting together a school carnival can be a lot of work, but it can help build a stronger school. NY Party Works can help make your job easier and get you ready for the fun! To learn more, contact us today.